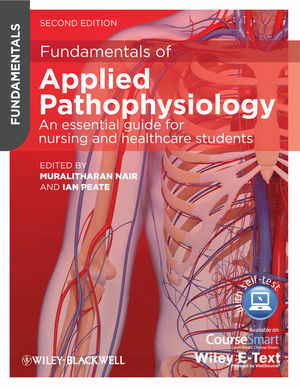 Fundamentals of Applied Pathophysiology is designed specifically for nursing and healthcare students, providing a straightforward, jargon-free, accessible introduction to pathophysiology. Highly visual and written specifically for students, the second edition of this best-selling textbook provides clear explanations of the anatomy of the human body, and the effects of disease or illness on normal physiology. To make study easier, the book includes learning outcomes, a range of activities to test learning, key words, end-of-chapter glossaries, and clinical case scenarios, and is supported by an online resource centre with further activities and exercises. Supported by an online resource centre at www.wiley.com/go/fundamentalsofappliedpathophysiology with fantastic extras for both lecturers and students, including an image bank, interactive multiple choice questions, true/false exercises, word-searches, glossary flash-cards, label-the diagram activities, and more! Muralitharan Nair is Senior Lecturer in the School of Nursing, Midwifery and Social Work, University of Hertfordshire,UK. Ian Peate is Professor of Nursing in the School of Nursing, Midwifery and Healthcare, University of West London, Middlesex, UK.